About a year ago, Peter Simonson committed himself to developing his writing. Getting accepted to Odyssey was a first accomplishment. Now he is working on a few different short stories and hoping to start submitting his work early next year. He enjoys writing fantasy and science fiction that play with paradigm shifts and cultural assumptions. 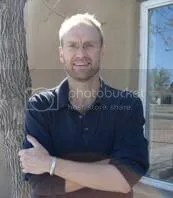 Peter squeezes in writing around his work as Executive Director of the ACLU of New Mexico. In 1994, he earned a Ph.D. in cultural anthropology from the University of Michigan. For several years, he lived in Latin America, but now he makes his home in Albuquerque, NM. He graduated from Odyssey in 2009. It’s been three months since I returned from Odyssey and already the memories run together–a blur of early morning lectures, critique circles, and late nights tapping out stories on my laptop. Like the bundle of student critiques that now sits on the desk beside my computer, I’m still unpacking everything I learned. Still, a few key moments of the experience stand out for me. Some you could call epiphanies. Others were just times I stepped back to appreciate the experience. If you are considering applying to Odyssey, these might give a sense of what it’s like to take part in Jeanne Cavelos’s phenomenal workshop. If you’re an Odyssey grad, maybe these moments ring familiar. An early moment came just a few days into the workshop. In a lecture about genre, Jeanne urged us to consider new ways of combining the elements of horror, sci-fi and fantasy. Students offered up ideas for original storylines. Certainly some of us had taken part in such discussions before, but for me, that lecture was my first time to share a free-wheeling discussion about story writing with people who shared my fascination with soul-stealing swords, life after Earth goes apocalyptic, and such. I realized that, in coming to Odyssey, I was granted a safe space to explore my ideas about writing fantastical stories—even the obviously unoriginal and patently absurd–and get honest feedback from others who were also struggling with such notions. Previously I had carried out those conversations all in my head. Now that the workshop is over, I’ve discovered that the “safe space” lives on in the Odfellow discussion group. I can continue those conversations even with accomplished writers, Odyssey grads all. Another key moment came an hour or so after I turned in one of my first stories for a class critique, as Jeanne delivered her lecture on character arc and internal conflict. The relief from finishing the story dissolved into dread as I realized that, had I heard Jeanne’s lesson just two days earlier, I would have written an entirely different story. Zeke Ballard, captain of the recon ship Tycho Brahe, would have struggled to reconcile his sense of duty to search for the alien parasite on the planet’s surface with an urge to, maybe…take up an early retirement! Instead, Ballard started out his life in laser print as an oddly dispassionate hero, batted around by circumstance like a hacky sack. Character arc became the Holy Grail of my Odyssey experience. It haunts me still. Days later, my fellow classmates took turns critiquing the second part of the Ballard story. By the last of the students’ comments, the story was bruised and battered, but it had avoided truly damning criticism and, again, I was lulled into a sense of relief. I learned from that moment that my writing is never as good as I think it is, and it can always improve. Award-winning authors would not escape an Odyssey critique circle unscathed. There were many other defining moments, to be sure, but I’ll conclude with this one. Jeanne was discussing style. . . . Control emphasis in your sentences by where you place your adjectives. . . . Manipulate the rhythm of your sentences to make us feel the event . . .
My fingers were punching the keyboard of my laptop so hard, the clacking turned heads. I wanted to capture every crumb of wisdom. Jeanne was giving answers to questions about writing that I didn’t know I had. It wasn’t the first time I had felt that way, but on this occasion I was anticipating my last one-on-one meeting with Jeanne that afternoon. I knew from other students that she was going to push me to propose a plan for continuing my writing after the workshop. It struck me, Odyssey was much more than a course I had received in exchange for tuition. In coming to Odyssey, I had received a gift—an offering of hard-won wisdom that Jeanne delivered with the same loving care and attention to detail that we writers devote to our stories. Tuition just covered the costs Jeanne needed to pay in order to bestow that gift. Before I left for Odyssey, another Odfellow, Becky Roland, confided that it was “one of the best things I’ve done in my life.” The same holds for me. I’ll always savor the moments.